After years of waiting for Android Pay, Google’s mobile payment solution for its Android operating system, is finally available in Canada. Google has revealed that the Android-based payment platform is compatible with a number credit cards — both MasterCard and Visa — from a variety of Canadian banks, including the following: BMO, CIBC, Banque Nationale, Scotiabank, Desjardins, President’s Choice Financial, ATB Financial and Canadian Tire Financial Services support Android Pay. Furthermore, support for American Express cards and Tangerine will be coming soon, says Google. Two notable missing Canadian financial institutions at launch are TD and RBC. When asked about TD and RBC’s absence from Android Pay’s launch partner list, Spencer Spinnell, Google’s director of emerging platforms, explained that the tech giant hopes to add more financial institutions to the platform in the future. “I can’t talk to specific details regarding partnerships. What I can say is if you look at other markets, the way we’re rolling out in Canada mirrors the way we rolled out everywhere across the globe. These organizations typically have large queues of work they need to get done,” said Spinnell. “We expect banks will come on board over the course of the next several quarters,” he continued. 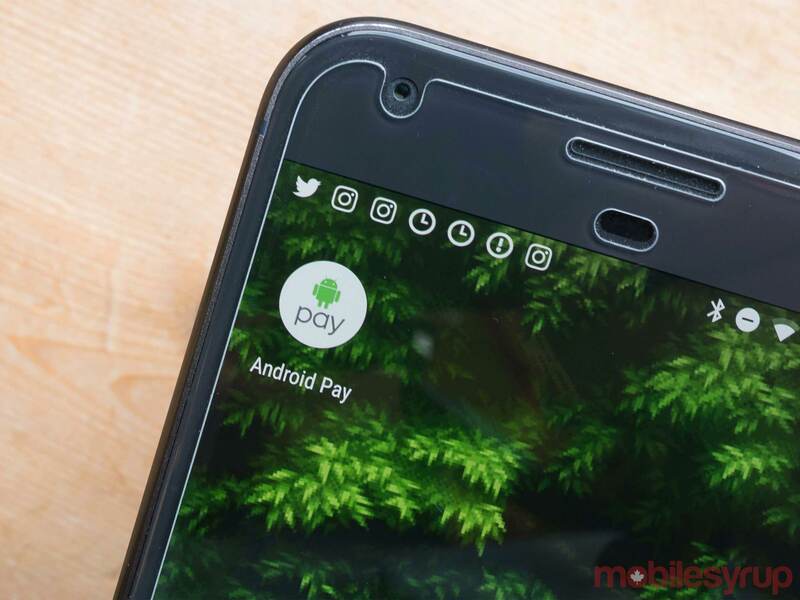 Spinell says that launching Android Pay in Canada has always been in Google’s plan, especially considering the country’s forward thinking view on payments. “Canada’s market we’ve been interested in since the beginning. There’s no specific reason [for the delay]. We think Canada is early. There’s a lot of technology that’s there. Every single market requires deep integration and broad adoption across the system. There was no particular slowdown,” said Spinell. 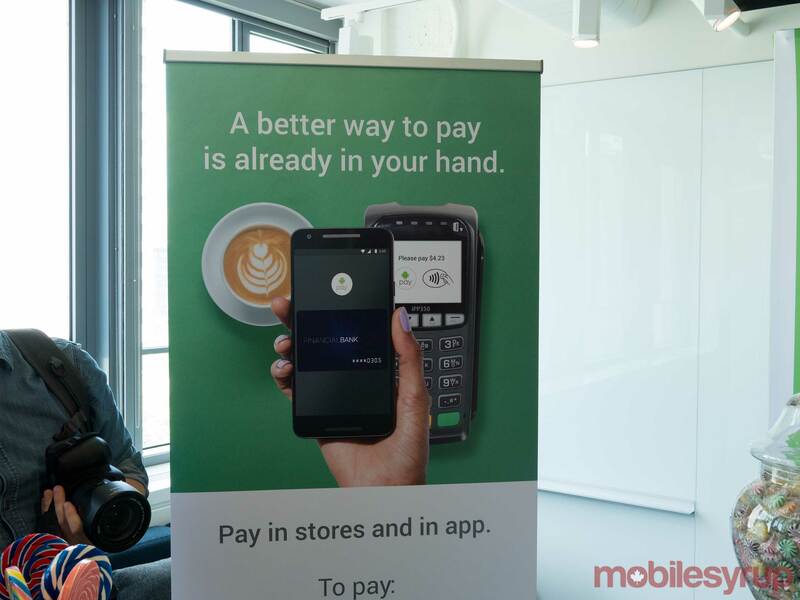 During an announcement presentation at Google’s head office in Toronto, the tech giant revealed a variety of interesting Canadian contactless and mobile payment related statistics. For example, one in three Canadian smartphone owners have already paid for a product via their smartphone, and Q4 2016 alone saw a 120 percent growth rate-year-over-year, according to Google’s statistics. Furthermore, eight out of 10 Canadian retailers have terminals with NFC capabilities, 41 percent of Canadians believe that their smartphone is more critical to their daily live than their wallet and finally, Moneris predicts that 50 percent of Canada’s 3 billion transactions will be contactless by the end of 2017. Payment card in-app payment partners include the following: Lululemon, Shopify, Uber, 1-800 Flowers, Atom, Fancy, Doordash, Hotel Tonight and Ritual. In-store launch partners include Indigo, Freedom Mobile, Jean Coutu, Loblaws, McDonalds, Petro Canada, Pizza Pizza, Rexall Pharma Plus, Rogers, Sears, Telus, Rogers, Fido and Tim Hortons. In contrast to Apple Pay, which takes approximately a 0.15 percent cut of every transaction according to estimates, Google doesn’t charge any fee to merchants. “Google doesn’t charge transaction fees,” said Spinell. In comparison, Apple Pay launched in Canada with support only for American Express cards back in November 2015, before expanding to additional cards and Canadian financial institutions in May 2016. 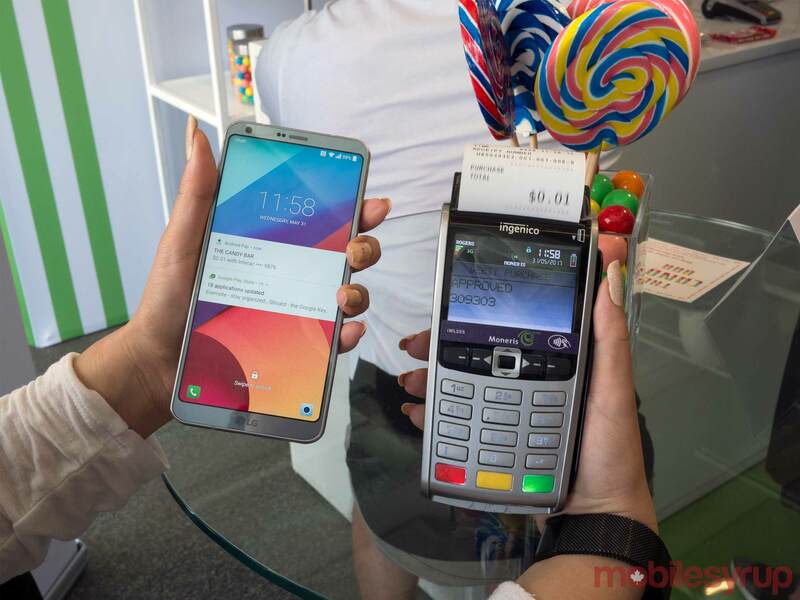 Steps for using Android Pay are relatively simple and comparable to Apple’s mobile payment platform. Users first wake up their device, then place it near a contactless terminal, and then the transaction is processed. 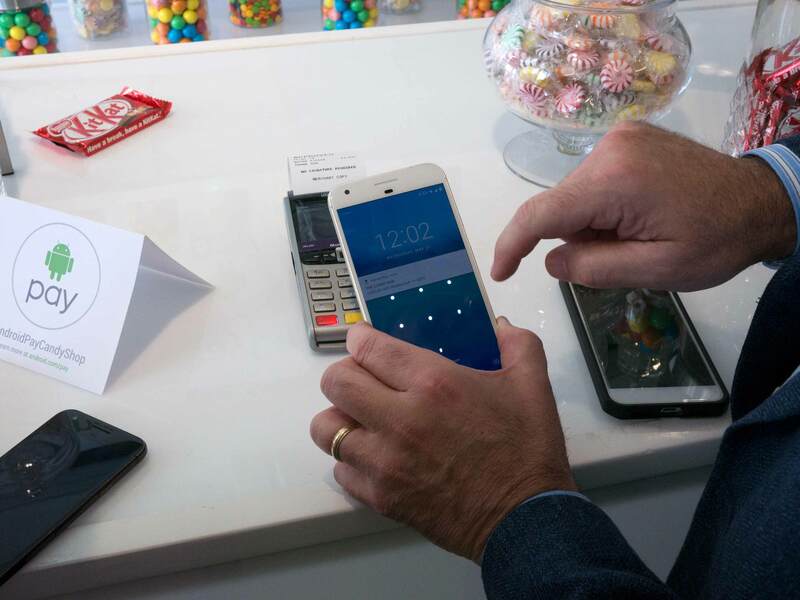 Android Pay has had 1.5 million new registrations per month on average in the U.S. alone. The mobile payment platform originally launched in the U.S. back in 2016 and has been gradually rolling out to 12 additional markets. News leaked to MobileSyrup via internal documents sent by an anonymous source regarding Android Pay’s Canadian launch last week. Support for Interac debt cards is set to launch on Monday, June 5th, according to Google, though at launch only debit cards from BMO Financial Group, CIBC, Desjardins and Scotiabank will be supported. “We don’t share specific projections of adoptions of these types of services,” said Spinnell when asked what Google’s expected adoption rate is for Android Pay in Canada. American Express is set to come later this summer, according to Google. In terms of browser-based shopping, Spinell says that Google isn’t ruling out the possibility and that Google wants to bring seamless transactions to the company’s Chrome browser. The platform’s maximum payment limit is $100 for tap and go payments. For transactions over $100 users are required to unlock Android Pay. Google says that Android Pay’s maximum spend limit is set by your bank’s credit card limit. Android Pay is available in Canada in the Google Play Store.